It's no secret that I loved Simon vs the Homo Sapiens Agenda, so when I first heard about the film of it, I knew I would see it in the cinema without any doubt. I also knew I would drag along my two best friends for the ride; they're usually up for seeing films with me. So we made plans to see it the first weekend it was out. We made a day of it - we met at The Light in Leeds and had a couple of drinks first, before going to the Vue cinema there. We were the oldest people by quite a margin - everyone else was in their teens or early 20s. I ADORED Leah. I was already excited about the sequel book, Leah on the Offbeat, but having seen the film I cannot WAIT to read it. A WHOLE BOOK of Leah is going to be amazing! I definitely think the film is a really good adaptation of the book. It retains a lot of the same feel and the same sweetness. 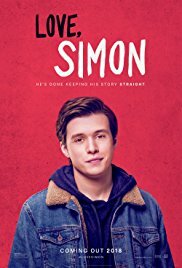 I think Nick is a perfect teen comedy hero, and a lot of the supporting cast is absolutely brilliant too. I can't wait to see it again!